Welcome to our new blog by Dr. Ruth MacPete! She’ll be contributing regularly on the Pet Health Network about all things pets. October is finally here! It’s my favorite time of year and Halloween is my all-time favorite holiday. Ever since I was a kid, I have loved Halloween. I loved the ghoulish decorations, costumes, and of course, candy. While I can’t say candy still motivates me the way it once did, I still relish decorating the house and getting dressed up. As a parent, I have the added pleasure of seeing my human children get excited about my favorite holiday, and at least for a few more years, I can dress them up in adorable costumes. This year we are all going to be pirates, even our dog Oski! Dr. Ruth MacPete's Blog is not intended to be a substitute for the regular veterinary care of your pet, which should be provided by a licensed veterinarian through regular, routine office visits, supplemented by diagnostic procedures and care as necessary. The blog is not an emergency consultation facility and cannot and does not provide individualized treatment plans for any pets or their situations. If your pet has been in an accident or is in need of immediate medical care, please contact your local veterinarian or emergency veterinary hospital as soon as possible. Arrrh! While my dog Oski likes dressing up (or at least is a good sport) and loves trick-or-treating with his family, not all animals enjoy Halloween. In fact, many animals are downright terrified by the holiday. In addition to being scary, Halloween can be dangerous to our pets, with candy and decorations being common household hazards. The spooky decorations, eerie noises, ghoulishly dressed little people ringing doorbells and yelling “trick-or-treat” can be frightening to our pets. If you have a nervous, shy or easily frightened pet it is best to keep them inside your house and away from the door. Likewise, if your pet is very protective, keep your pet safely secured inside the house. Sadly, many frightened pets get lost during Halloween every year when they dart out of an open front door or escape from their yard. It’s best to give your pet a treat and keep them safely away from the commotion in a back room. Scary trick-or-treaters aren’t the worst hazard to our pets. Candy is probably the biggest danger. As most people know chocolate is toxic to our pets and can be fatal. However, it’s not just chocolate that we have to watch out for. Candy with xylitol, like sugar-free gum, is also vey dangerous to pets. Xylitol causes insulin release and low blood sugar levels and can lead to liver failure. Be sure to keep all Halloween candy away from your pets. If your pet manages to steal some candy, immediately call your veterinarian for help or take your pet to a veterinary emergency clinic. Halloween decorations can be another big danger to our pets. Flickering candles, jack-o-lanterns, and twinkling lights don’t just capture our attentions, pets are curious by nature and are drawn to these lights as well. Unfortunately, pets can get burned if they get too close to a candle or jack-o-lanterns, or worse, start a house fire. Halloween lights are pretty but can also be dangerous to ours pets. Pets can get tangled in lights, or worse yet, they can get electrocuted if they chew on them. 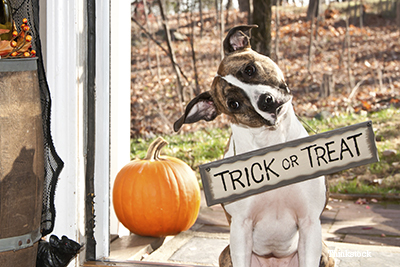 This Halloween, make it a priority to keep your pets safe and sound. Keep your cats inside if you don’t already do so, and don’t leave your dog outside, especially if they are shy, nervous, or easily frightened by kids, loud noises, and lights. Be aware of common Halloween hazards like candy and decorations. Finally, if your pet doesn’t already have a collar, ID tag and microchip, get these before Halloween just in case your pet gets frightened and runs away during all the spooky commotion.